Not me that is for sure, I loathe RBR. Here is an interesting thought imagine if Verstappen went to Ferrari and was Vettels team mate, how would that go down for Vettel I do not think Vettel would like that very much...I think there would be crazy fireworks at Ferrari if that happened. So how do I read the speed traps? RBR is marginally quicker than Williams? No, that's called what difference a 4x WDC makes. They did something in the week before Silverstone last year. Is that the same event? London is lobbying for an F1 race. I may well walk away from F1 if it ever happens. Complicated! One way of interpreting it is that by the time we get to the timing point our car is working well. When you equate that against lap times it shows that our car is not working well in other parts of the circuit. So on straights for instance other cars are turning their tyres on quicker so they can go faster for longer. We also have reduced grip on the twisty bits of the circuit. The wind, the wind, the heavenly child. In the fairy tale of Hansel and Gretel this sounds poetic, but for Sergei Sirotkin today's wind was anything but heavenly in qualifying Shanghai. On the contrary, he even cost him the entry into Q2, the Russian claims. "On my fast lap I had a pretty strong breeze, which cost me exactly 0.06 seconds," he says. "We were a bit too strong," he explains the upswing in FT3. His two attempts there were quite extraordinary and better than those of his competitors. "That probably created higher expectations, but they were not justified," he says. "When everyone did their job (in qualifying, editor's note), we fell back - but not because we did something wrong." Despite leaving Q1, Sirotkin is "very happy," he says. Because Williams has made great progress since the last race in Bahrain and he once again learned a lot. edit: Stroll: "We have every reason to believe that we'll be back in Q2 and Q3 soon." Edited 1 time(s). Last edit at 14/04/2018 15:02 by Ihminen. I think Lance must have been sent to PR 101. He hasn't been talking like a team leader. All we have seen is him being sullen to date. This, I think, is his attempt to lead the team and give the people who are losing sleep and busting a gut on his behalf some encouragement. I think he needs more lessons. It is forecast to be hot for the race. Will it improve the car or make things worse again? "We're closer to each other than Bahrain," he says, adding, "Not me personally." The Canadians have had a difficult weekend so far, and after his spin he was behind in the second practice, he says. "The third practice was to make up for the backlog, so in qualifying I had to figure out where the limit was and I was on the verge of discovering it, I think," he says. However, Williams is likely to have a difficult time in China from 16th to 18th. Stroll struggles according to his own words with the engine still with the overheating symptoms from Melbourne. Nevertheless, he assumes that possible warmer conditions should meet his team - especially because the Longrun on Friday looked positive. And then it should go further up. Anyone checked the long runs? Is there any possibility of beating Sauber and STR in race conditions? So Ferrari was 4 tenths quicker in qualifying and 9tenths off in race conditions? 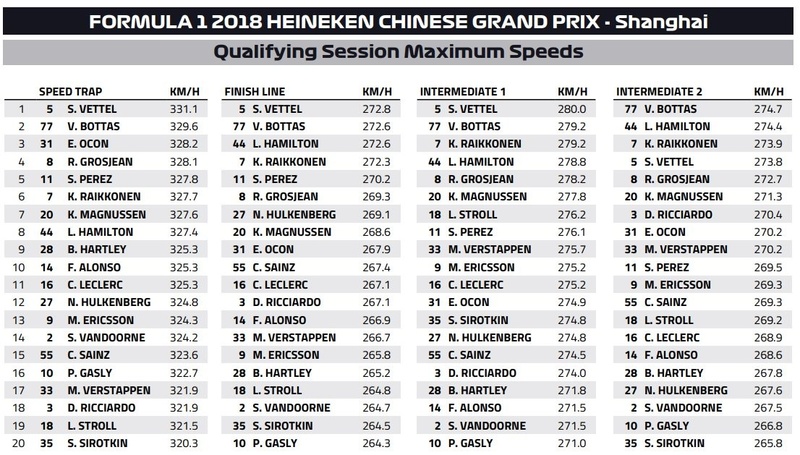 That's 1.3sec difference between quali and race modes which is unrealistic even if Mercedes will be faster tomorrow. I believe we have a good chance to be not the last team and that's going on the right road...improving step by step.